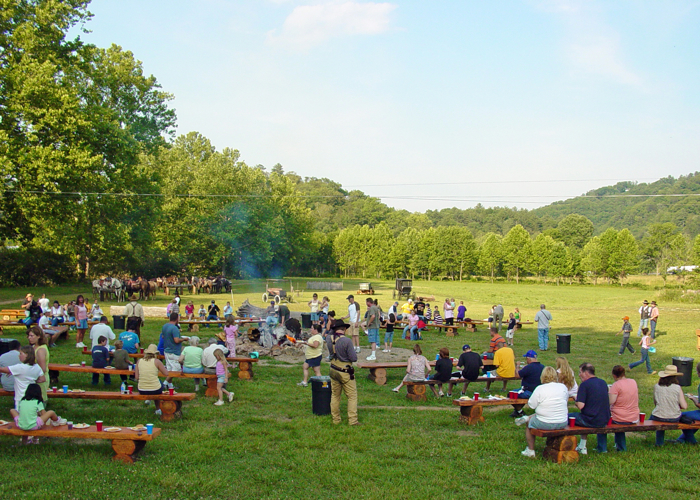 Saturday, May 24 kicks of the 2014 summer season of evening bonfires at Waldens Creek Stables, held once a month through October. 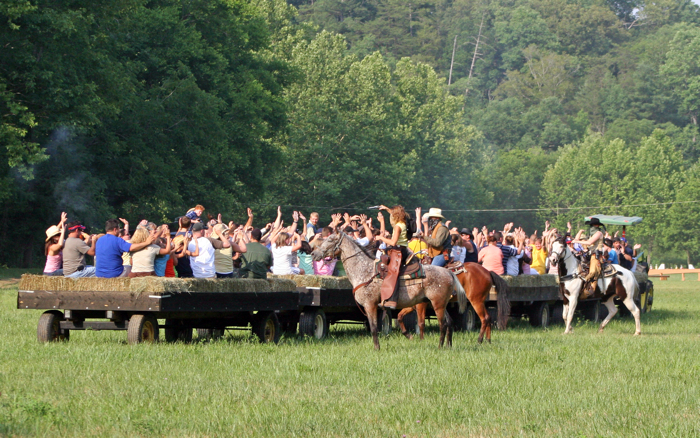 After a hard day of riding horses – or perhaps lazing on the deck, shopping in town, or swimming in the pool – what better way to enjoy a fine summer evening in the Smoky Mountains than to take a hayride out in the foothills. 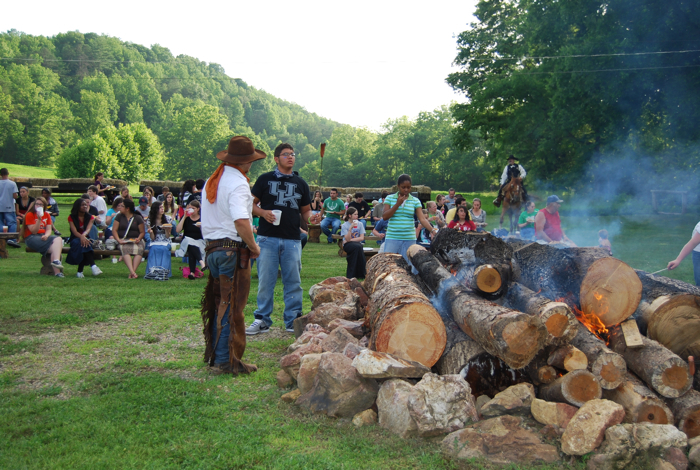 Let the cowboys of this 500-acre horse ranch and riding stables deliver you to the bonfire site, for dinner, entertainment (horse and cowboy style) and even pony rides for youngsters 10 and under. 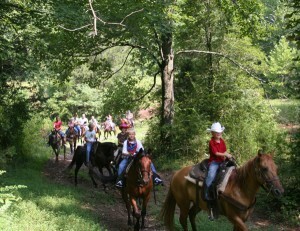 On its huge acreage of mountains, valleys and streams, Waldens Creek Stables has over 100 horses, and lots of cowboys and cowgirls acting as trail guides, teachers and buddies for every member of the family – young or old, experienced or novice, brave or nervous, and even with special needs. The ranch has 6 major trails with picture-postcard perfect views of mountains and natural terrain, and each trail catering to different types of experience. Amble past old homesteads, a moonshine still, across wooden bridges, through the trees and crossing the numerous streams, riding along and cresting the foothills of the Smoky Mountains. As it is eveywhere, it’s the people who can make or break a visitor’s experience. And everyone who visits the ranch seems to agree that the guides are wonderfully sensitive to the feelings and comfort of their riders. The same could be said of their attitude to the horses – as well groomed a bunch of contented animals as you’re likely to see anywhere. Satisfaction runs high among visitors to Waldens Creek Stables, as evidenced by the glowing reviews on TripAdvisor and Google. In fact, the stable is a winner again in 2014 of TripAdvisor’s Certificate of Excellence. Waldens Creek Stables offers a variety of packages to match its trails, ranging from short sessions to 2-3 hour rides with a lunch break in the middle. The Stables conducts wedding ceremonies also, for horse lovers who want especially romantic memories of their wedding. Waldens Creek Stables offers a wide variety of entertainments, including good food and a western wear gift shop. How about a gunfights and shoot-outs in a Wild West show, fast-draw performances, singing cowboys and a supper show? Take a relaxing carriage ride, view horse training from the observation deck, or just hang out on the ranch. There are also overnight camping trips, offering a magic night time when the mountains and skies come alive with sound and mystery. But the monthly summer bonfire is a special time when evening comes into its own. And unlike every other activity at Waldens Creek Stables – where space is always limited and events book up fast – for the bonfire you can’t make a reservation. Just be sure to show up by about 6:15 pm and get on the hay wagon that leaves at 6:30. Of all the magnificent horse riding experiences and outfitters in the Smoky Mountains, we have to say that Waldens Creek Stables is our favorite. This is why Cabins of the Smoky Mountains gives one FREE adult ticket to the bonfire to its guests. Call us toll free at 866-34-SMOKY for details. The ranch is located less than 10 miles outside of Pigeon Forge to the west, taking Waldens Creek Road off of Wears Valley Road. For more information, check the Waldens Creek Stables website, and call (865) 429-0411.